My mom and I had some mother-daughter bonding last week. We had a nail spa night at one of our favorite nail salons. Favorite because we know the nail technicians for years and vouch for their superb service. I would always bring at least 10 nail polishes for my mother to choose from. That night, I suggested we had the same color and she agreed! Of course, I promised her nail art when we got home. After I painted her nails, I did mine too! Our design -- daisies! 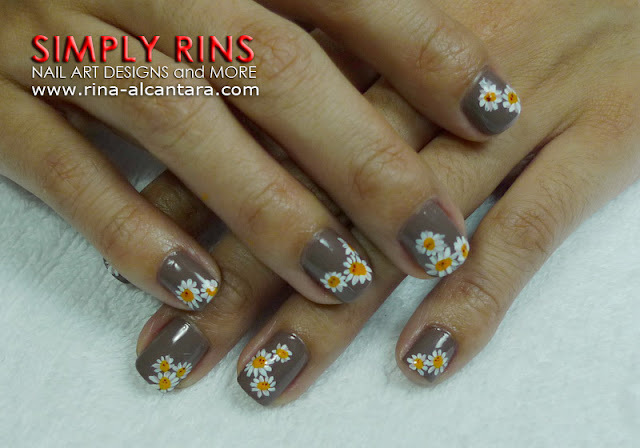 On my Nanay's, I painted daisies on her nail tips. I used acrylic paint for everything. I didn't want a bright yellow color for the center of the flower so I opted for a yellow orange shade. So why daisies? It was a spur of the moment thing, actually. I just wanted something that will pop out with our chosen base color. Nanay suggested something white but I figured it needed at least another color for the nail design to come alive. Hence, the daisies. I thought it was a perfect idea. Nanay and I used 2 coats of Milani Teddy-Bare for our base color. Looks like mocha to me. Yes, you're looking at my nails here. After I finished painting Nanay's nails, I proceeded to do mine. I wanted us to have the same design so I still painted daisies. But to make it a little different, I painted the daisies in random. I was also able to capture this design in photo as it unfolds. This is just white paper. I use water to get the consistency I like. 1. I painted the petals first using white acrylic paint. I painted different sizes too. Paint any size of depending on your preference. Personally, I found it easier to stroke the brush with the tip pointing outward then move towards the center of the flower. 2. I randomly painted very light brown strokes over the white petals for highlight. This will give the daisies a little depth. This step is optional if you like to just have the petals on pure white color. 3. Then I added the center of the daisies with a yellow orange shade. These are oblongs rather than circles to create an almost sideview perspective. 4. Finally, for further details, I added a few brown dots on the center of the daisies. Seal your design with your preferred top coat. I used Seche Vite Fast Dry Top Coat on this design. Daisies are a symbol of purity, innocence, and simplicity. As per reading, daisies actually belongs to the Sunflower family. Makes sense as their petals are very much similar. I personally like them because of their daintiness. amazing! I haven't worn taupe for the longest time, and this is just the perfect concept to wear taupe =) mind if I did my own version in the following days? Looks great! I love your flat sandals! It sounds like you both had a great time! Love the mani and pedi's...you're very talented! I use acrylic paint for my freehand nail designs. Thanks for a fun tutorial! I also tried it, and posted the results on my blog. Mine didn't turn out as cute as yours... maybe I'll have to give in and buy acrylic paints. That's too cute. If you can get her to have a cartoon on her nails I want pictures! =) I've never done a matching mani with my mother but we did get a matching pedicure once. Love the design. You probably won't see this comment, but I did a version of this that posted today!